If nothing else, the Palestinians’ UN statehood gambit goes a long way towards revealing the deep-seated European and US pathologies that enable and prolong the Palestinian conflict with Israel. In a nutshell, the Palestinian Authority – or Fatah – or PLO initiative of asking the UN Security Council and the General Assembly to upgrade its status to that of a sovereign UN member state or a sovereign non-UN member state is an act of diplomatic aggression. Eighteen years ago this week, on September 13, 1993, the PLO signed the Declaration of Principles with Israel on the White House lawn. There, the terror group committed itself to a peace process in which all disputes between Israel and the PLO – including the issue of Palestinian statehood – would be settled in the framework of bilateral negotiations. The PA was established on the basis of this accord. The territory, money, arms and international legitimacy it has been given was due entirely to the PLO pledge to resolve the Palestinian conflict with Israel through bilateral negotiations. By abandoning negotiations with Israel two years ago, and opting instead to achieve its nationalist aims outside the framework of a peace treaty with Israel, the Palestinians are destroying the diplomatic edifice on which the entire concept of a peace process is based. They are announcing that they have no intention of living at peace with Israel. Rather they intend to move ahead at Israel’s expense. In truth, there is little new in the Palestinians’ behavior. They have been using the UN to weaken Israel diplomatically since the early 1970s. Moreover, even if their bid does provide them with upgraded diplomatic status, it won’t change the reality on the ground, nor are the Palestinians particularly interested in changing the situation on the ground. So if nothing will change on the ground, why do the US and the EU care what the Palestinians do at the UN next week with their automatic General Assembly majority? Why have the senior peace-processors of Washington and Europe descended on Jerusalem and Ramallah, begging and pleading with the Palestinians to cancel their plans? Why have the Americans and the Europeans been pressuring Israel to make massive concessions to the Palestinians in order to convince them to put out the diplomatic fire there have set at the UN? Why are the White House and the State Department telling the media that the US will consider it a major diplomatic embarrassment if the Palestinians go through with their threats? Why in short, do the Americans and the Europeans care about this? THE PALESTINIANS have certainly never given either the Americans or the Europeans a good reason to support their cause. Just this week, the PLO representative in Washington told reporters that the future state of Palestine will ban Jews and homosexuals. And yet, the Obama administration and the EU have made the establishment of a racist, homophobic Palestinian state the greatest aim of their policies in the Middle East. Every single Palestinian leader from the supposedly moderate Fatah party has rejected Israel’s right to exist and said that they will never set aside their demand that Israel accept millions of foreign-born Arabs – the so-called Palestinian “refugees” – as citizens. They say this with the full knowledge that this demand is nothing less than a demand for Israel’s destruction. And yet, both the US and the EU, which certainly do not support the destruction of Israel, insist that it is imperative to strengthen and support the supposedly moderate Fatah party which seeks the destruction of Israel. Every year, the US and Europe transfer collectively approximately a billion dollars in various forms of aid to the Palestinian Authority and yet, the PA has failed to develop a market economy capable of supporting the Palestinians without foreign assistance. Instead, they have developed a welfare society where most economic activity stems from foreign handouts. Rather than feel embarrassment at their failures, PA leaders use their economic corruption to continuously threaten their patrons. If aid is cut off, they say, the PA will disintegrate and the far more popular Hamas movement will take over, and then, woe of woes, the peace process will be destroyed. Of course, Hamas is also sustained by Western aid money. Every month, the same PA that warns of the dangers of a rising Hamas transfers tens of millions of dollars in foreign aid to Hamas-controlled Gaza to pay salaries of Hamas “government” employees. Yet despite its mafia economy, and its exploitation of their aid funds to support a terrorist organization, the US and EU insist on maintaining the PA’s status as the largest per capita foreign aid recipient in human history. And they do so even as the Eurozone is on the brink of collapse and the US is descending rapidly into a new recession. Finally, in the interest of maintaining the peace process, aside from periodic pro forma statements, the US and the EU have turned blind eyes to the PA’s routine and institutional glorification of terrorist mass murderers and Nazi-style anti-Semitic indoctrination and incitement of Palestinian society. Given their absolute commitment to the so-called peace process, it would be reasonable to expect the US and the EU to oppose the Palestinians’ decision to move their conflict with Israel from the negotiating table to the UN. After all, in acting as they are, the Palestinians are making clear that they are abandoning the sacrosanct peace process. The Obama administration is engaging in desperate eleventh hour diplomacy to convince the Palestinians to cancel their UN plan, because it does not wish to oppose it. Most EU member states are expected to support the Palestinian bid at both the Security Council and the General Assembly. The fact that the US and the EU are reluctant to oppose the Palestinian UN initiative, despite the fact that it destroys the foundations of the peace process, tells us two things about the Americans and the Europeans. First, their support for the Palestinians has more in common with a psychological obsession than with a rational policy decision. say or do to convince them that the Palestinian case is anything other than wholly and completely just. There are many possible explanations for how they arrived at this obsession. But the fact is that it is an obsession. Like all obsessions, their faith in the justice of the Palestinian cause is impermeable to contrary facts or rational interests. The flip side of this obsession is, of course, a complementary obsession with blaming Israel for everything that goes wrong. For if the Palestinians are always in the right, and they are fighting Israel, then it naturally follows that Israel is always in the wrong. This “Blame Israel First” mindset was exposed in all its madness in a New York Times editorial on Thursday. Despite the Palestinians’ refusal to negotiate with Israel, despite Fatah’s unity-government deal with Hamas, and despite their rejection of Israel’s right to exist, the Times argued that Israel is to blame for the current crisis in relations. In the paper’s view, Prime Minister Binyamin Netanyahu “has been the most intractable” party to the conflict. Netanyahu’s crime? He has permitted Jews in Judea, Samaria and Jerusalem to exercise their property rights and build on land they own. Intrinsic to the Times‘ claim, (and to the Obama administration’s EU-supported demand that Israel disregard Jewish property rights in Jerusalem, Judea and Samaria), is an embrace of the Palestinians’ bigoted position that Jews must be banned from the future Palestinian state. That is, like the administration and the EU, the Times‘ support for the “just Palestinian cause” is so comprehensive that its editors never even question whether it is reasonable for them to be completely committed to the establishment of a racist state. It is this inability to consider the significance of their actions that removes Western support for the Palestinians from the realm of policy and into the sphere of neurosis. The second lesson of the US and European unwillingness to oppose the Palestinians’ UN statehood bid is that the Obama administration and the EU alike are obsessed with getting on the right side of inherently anti-Western international institutions. Here, too, the reason that the position is an obsession rather than a considered policy is because no conceivable rational US or European interest is advanced by strengthening the UN and similar bodies. Administration officials have repeatedly said that they do not wish to veto a Palestinian statehood resolution at the Security Council because they do not want to isolate the US at the UN. It is due to their aversion to isolation that the administration has worked so intensively in recent weeks to convince the Palestinians to cancel their UN plans, by pressuring Israel to give them massive concessions. It never seems to have occurred to anyone at the White House that standing alone at the UN more often than not means standing up for US interests, and that standing with the crowd involves sacrificing US interests. As for the EU, their automatic support of the UN is somewhat more reasonable. Although the UN majority systematically empowers states and forces that are hostile to Europe, many EU member states share the UN majority’s anti-Israel and anti-American positions. So by voting with the majority, EU member states are able to act on their prejudices without having to own up to them. Moreover, many EU states have irredentist Islamic minorities. 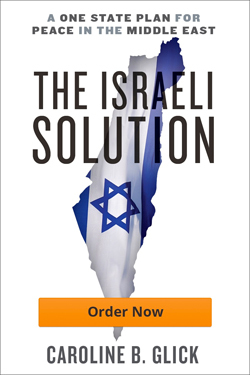 Joining the Israel-bashers at the UN is a low-cost way to appease them. On Thursday, Netanyahu announced that he will address the UN General Assembly in New York next week and put the truth about the Palestinian cause on the table. But whether he makes a difference or not, at least reason will have one defender at the UN next week.